We have tons of flooring on sale! Save up to 40% on in-stock hardwood flooring and carpet! Save up to 20% over everyday low pricing on flooring. We carry ceramic and porcelain tile, vinyl/resilient flooring, laminate flooring and natural stone products! Products from all of your favorite manufacturers such as: Mohawk Floors, Emser Tile, Harris Wood, and more! 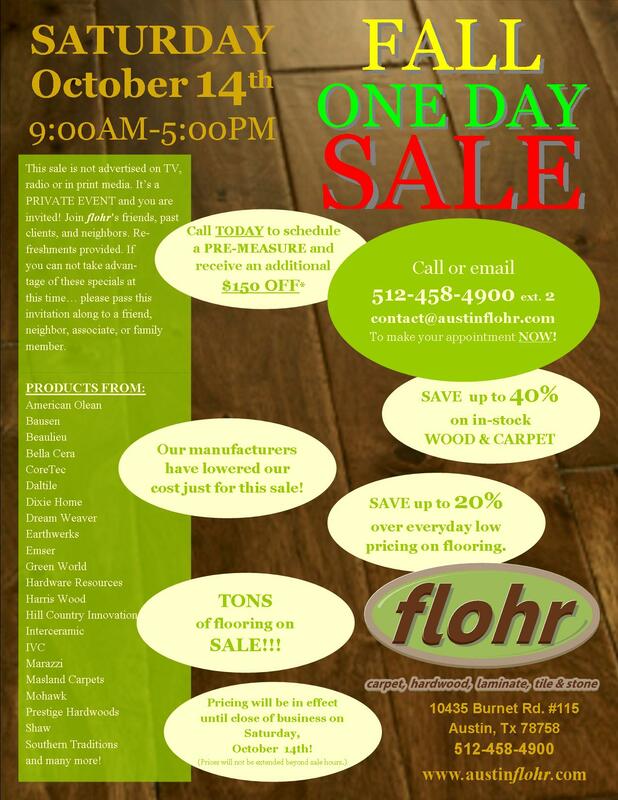 Call 512.458.4900 or use our online One Day Flooring Sale Estimate Form TODAY to schedule a pre-measure appointment for even greater savings! Brian did a great job at setting everything up and the crews that installed both our carpet and tile did a fantastic job – thank you.